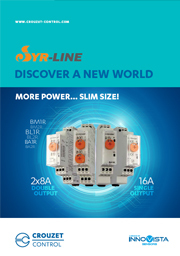 Description: The new specialized range at Crouzet, aimed to satisfy the most unique requirements of your applications by innovating in design, engineering and development. 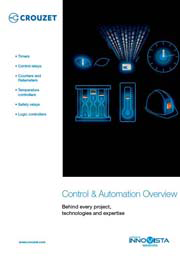 Description: A quick overview of our master products. 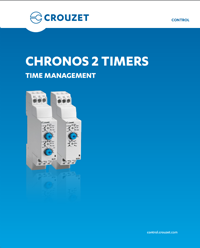 Chronos 2 timers (17.5 mm) with an improved electronic and mechanical design allowing added robustness and reliability. Description: These products are particularly suited for use in water treatment, waste processing, renewable energy, HVAC, access control, building equipment, agriculture and industrial automation markets. 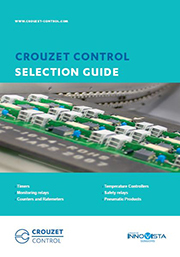 Description: Crouzet’s Pneumatic expertise provides you with an offer to meet all your automation system requirements, including systems for explosive atmospheres. 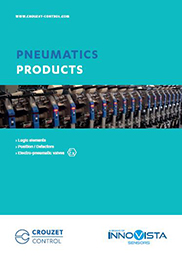 The quality of the Pneumatic components is based on a rigorous organisation which meets all current European and international directives, standards and approvals.